Starbucks announced yesterday that it has purchased the California-based juice company “Evolution Fresh,” and will begin opening juice bars in 2012. The plan is to expand the “Health and Wellness” category by offering very freshly-produced juices. 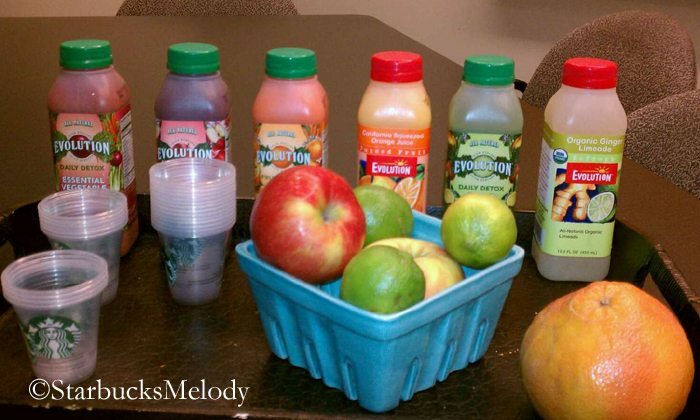 Right now, Evolution Fresh juices are already available at some retailers like Whole Foods, but soon they will replace the Naked Juice offerings at Starbucks, and they will be available more widely in grocery stores. Eventually, Starbucks plans to open up a number of juice bars that offer customers an experience in fresh blended juices. News articles have described this as a chain of stores which would compete with retailers like Jamba Juice. 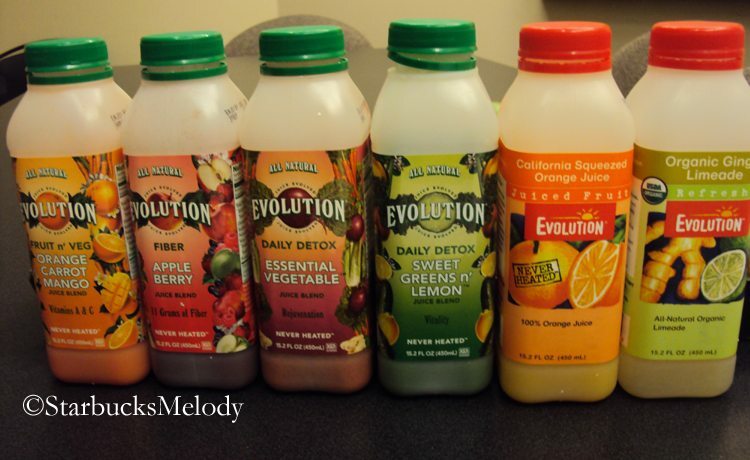 Glancing at the Evolution Fresh website, it looks like there are about 25 different juices (or blends of juices) that they offer. There is everything from Pomegranate, to Watermelon, to Vanilla Chai to Magical Mango to Strawberry Lemonade, and many more. And, from what I can see, the list of 25 juices or so on the Evolution Fresh website does not appear to be a complete list. 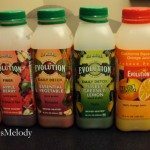 I had heard that there are closer to about 36 different juices offered by Evolution Fresh. 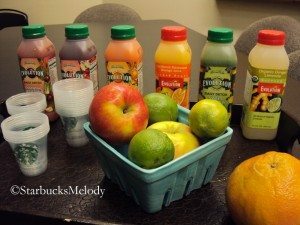 From what I understand, Starbucks will showcase six juices that you may find in the refrigerated case at your local store, and of course, many more flavors will be offered in grocery stores and in the juice bars. My understanding is that not all Starbucks will necessarily offer all six of the highlighted juices, given that many stores are small and won’t have the demand for six bottled juices. At least from what I know (and please be aware that at this early stage, nothing is written in stone) the six flavors to be showcased in Starbucks stores are Orange, Organic Ginger Limeade, Sweet Greens ‘n Lemon, Orange Carrot Mango, Essential Vegetable, and Apple Berry. I had the chance to try all six showcased-flavors today! They all really do taste very fresh, and have sweet fruit and vegetable aromas. I found myself wanting to slurp the juices, like in a coffee tasting. 😉 I really liked the Orange Carrot Mango flavor. You can taste a lot of the carrot, but it’s sweet and delicious still. And I’m glad the other two juices do not overwhelm the carrot juice. Actually, I would like to see a plain carrot juice offered in the stores. I will say that the Sweet Greens tasted a bit too much like celery for my liking. Also, you can definitely taste the cucumber in the Sweet Greens too. I am not a fan of ginger as a flavor, so the limeade didn’t do anything for me. The Apple Berry has some blueberry flavor to it, and it is really delicious. Actually, you can see what looks like pieces of blueberries in the juice itself. It was so good! Surprisingly, the Essential Vegetable was delicious! Also, I liked the orange juice, but it wouldn’t be my first choice because I tend to gravitate towards the juice blends. The orange juice had some noticeable pulp in it – I liked that quite a bit, but I imagine the pulp in the orange juice won’t appeal to some customers. In many ways, it seems like there will be close to zero disruption to Starbucks stores because the only significant initial change is new offerings in the refrigerated case. There is a part of me that wonders if we will ever see new Vivanno Smoothie flavors out of this, but it’s far too soon to speculate about that! I like the idea of new juices in the ready-to-drink cold case, and hopefully the new juice bars will be a hit. By the way, the juices are all pasteurized using a “high pressure pasteurization” process which means that they are never heated. My understanding is that this is the best way to pasteurize juices to get the freshest flavor, though I’m definitely not an expert on pasteurization, so I don’t have much to say about that. So what do you think of the new juices and plans to expand? It seems like the Starbucks family of brands is growing in grocery stores. The acquisition of Tazo gave Starbucks the chance to have a number of tea products in grocery stores, and now this will allow for a number of juice products in your local grocery. By the way, this is a United States (and maybe Canada?) product only at this time. Since Starbucks supplied the juices that I tried, I think I legally have to disclose that in conjunction with this blog post. All of the juices were supplied by Starbucks for me to try. Christmas arrives at Starbucks today. Starbucks Leadership Lessons - Cliff Burrows stories. For the win at your local grocery: Bottled S’mores and Mocha Coconut Frappuccino Beverages! Crystal Shipman: Starbucks partner & passionate about all things Evolution Fresh. Those juices all sound YUMMY. I’m going to have to see if I can find them in my local grocery stores! @Kitenarie – Oh you’re right – They aren’t called “Vivannos” anymore but that name did get stuck in my head. I do think that eventually, somehow this new expansion will affect the smoothies – maybe Starbucks will add a flavor? Who knows. By the way, I just went to Whole Foods, and much to my surprise, their selection was fairly small. I got the 100% carrot juice to try! I think it would be hard to find all six of these above flavors. And I also think (well, just making a wild guess here) that Starbucks will start out giving the stores the chance to order those 6 juice flavors, but eventually they’ll cut out the ones that don’t sell, and two or three best-sellers will be avail in store. I imagine the limedade would be best in the summer. That’s always the way… and I bet it will be the one that I love. We all loved Green Machine at my store… and now it’s gone. I’m looking forward to new juices to be honest. I’m not really all that big a fan of mighty mango or berry blast. This is such an exciting development for us! What I find weird though @kitenarie is that you guys canned Green Machine? We still sell Green Machine and another variant called the Blue Machine? Then again we also canned the entire Vivanno or Smoothie line completely about two years ago too. Different markets, I suppose! I still call them Vivannos, and my market still makes them. As far as I’m concerned, I want this acquisition to benefit both the Vivanno and possibly even the Refresher line (whenever/if ever it launches)! The question that I keep thinking of, though, is how much their plant can produce. Are they operating at full force now? How much faster than the current operation speed is that? And is it initially possible to expand their production enough to supply our retail stores, the new Evolution stores, and the CPG market (which blows through MILLIONS of units)? Hm. I also get the fresh juice that my whole foods makes with fresh veggies and love it. 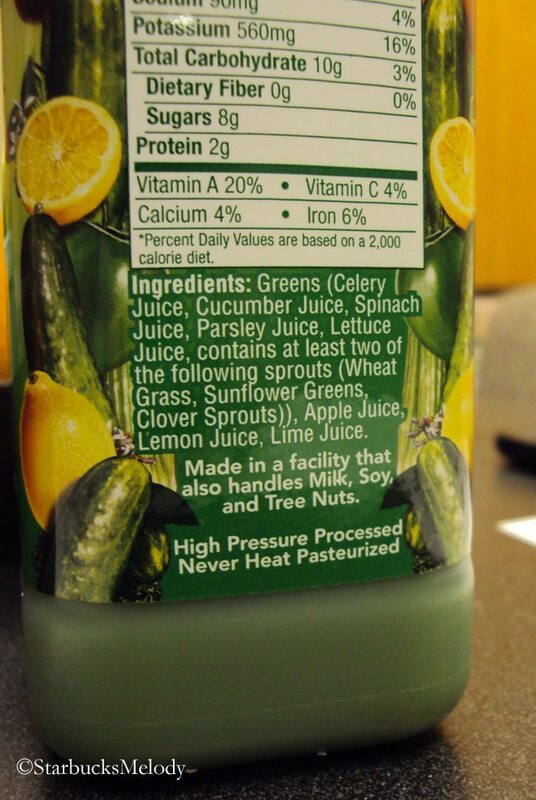 I would hope these juices at SB would be akin to that. With SB opening juice bars, does that mean they are going to open fewer regular stores? 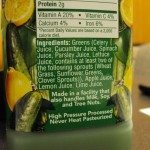 Could you post an image of the top of the nutrition label? 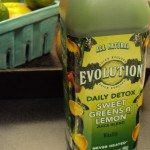 I think the Evolution drinks are in 8 oz bottles, but labelled as 2 servings, which is something I find a bit deceptive. Not to mention that a “greens” drink with no fiber seems to be a wasted opportunity. Will be interesting to see how many of the products are eventually offered. I will miss my green machine juice! @TheatreNut – I have a small problem getting the pics for this article, which is why there are so few. My camera battery was very low when I was at the juice tasting, and then on top of it, somehow during the course of the day, I misplaced the battery charger that goes with my camera. My camera is dead at the moment (because the battery is dead) and I can’t get anymore photos off of it. I have to figure out something asap because photos that I need for future blog posts are on it. @Amazonv – I don’t think I ever noticed Green Machine, I usually gravitate away from any juice that is green in color. 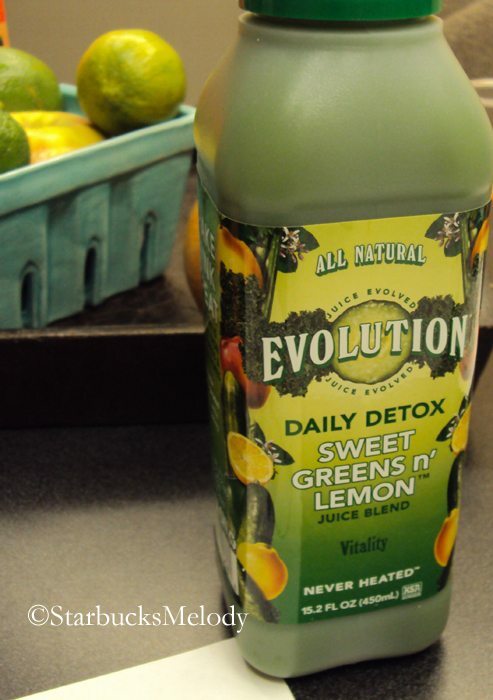 But I hope you get to try the green one of the Evolution juices -Celery and cucumber and lemon? @Sammy – I don’t think these are going to go international anytime soon. Right now Evolution Fresh only has one production facility located in San Bernardino, California, and so just producing for the US Starbucks stores is going involve a lot of work! OH this got me thinking… what if Starbucks bough jamba juice? (I know it won’t happen but…) My two favorite drink place combined into one. Any way this is pretty cool I’v always thought the one thing missing from Starbucks was smoothies. @Blakeco123 – I always liked Jamba Juice but there are fewer of them now then there were before. I hate to admit it, but my fave drink was the Peanut Butter Moo’d – Absolutely nothing healthy about it. I am really looking forward to the Evolution Fresh Juice Bars, though I really worry that it will have to stay very small and only in a few markets. In a recession, lots of people won’t spend $5 on some fresh juice. At Whole Foods, I think the price of the bottles (about 15 ounces?) is around $4 each roughly – also a price that will keep many folks away from them. @Theatrenut – I think each bottle is two servings. Just looking at what I bought at Whole Foods yesterday. 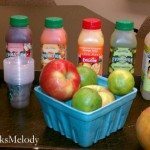 My sense is that the calories for a full bottle of the juices are going to range from like 150 or 200 calories, to maybe a top end of 400 calories for the juice. Each bottle is two servings. Just plain carrot juice is actually fairly low calorie, but I would think that the apple berry and some the blends will be a little more. I have to admit…these all sound like wonderful juices. However, I’m not going to Sbux for juice. I will get my juice in the grocery…Whole Foods, wherever…not what USED TO BE my coffee shop. I guess I am one of the few still going to Sbux for my COFFEE, or coffee drink and maybe a treat, and my whole beans for home. Really, I wish they’d stop with all the other stuff. more 7-11 (ok, a step above….Whole Foods) Bring back more coffee releated everything…..and I’m not including “flavored” beans and any more expansion of their “instant” (VIA). I chatted today at SB with a friend about the new juice bars coming and got a mixed response. Of course, it was only one person’s response, but that got me thinking as to what the general response would be. BTW when these juice bars open will the SB name be on them? @Denise – I think this is going to be less of a disruption to the Starbucks experience than any Via or smoothies. For most people, all they’ll notice is that Naked Juices are gone, and have been replaced by these juices. I think the new juice bars will have their own imprint, but I do see an opportunity for new stores to be constructed side by side in appropriate markets. I think that the retail juice bar business is even trickier than the coffee business, as it is hard to build in everyday regular customer visits in general, let alone in colder markets. Jamba Juice has done alright, and there is room for a competitor (especially when supported by Starbucks’ distribution channels), but I think this will mostly be about the bottled juices we sell in the stores. Ah Green Machine! That’s a great drink – scary looking – but great (kind of tastes like apricots). My son really likes it and was disappointed when Starbucks dropped it. I’d like to see this be successful and am looking forward to it. I do think someone could make a big run for the health sector in the food service business. Starbucks seems to have moved away from their stated intention a few years ago to address that market (about the same time Michelle Gass moved to SBC). Maybe they’ll really give it another go with this acquisition. The addition of these juices will not do much for me, but my daughter is very health conscious. I’m guessing this may be a nice addition for her as she drinks little if any coffee when accompanying me to Starbucks. I’m with Denice and Amanda. I don’t go to Starbucks for juice. i think I will stick to my coffee.Tomorrow is the day Ethiopia Harrar comes out. I’m looking forward to trying that on the Clover. @Chgo – Trust me, Harrar from the Clover is the kind of thing that will give you faith, all is fine at Starbucks. Still a coffee company. Hopefully it will make some of you feel better to know that this isn’t something that has been made a big deal to us as partners. In fact, the only reason I know about it is because I read it on FB, Twitter, and here on Melody’s blog. As far as I can tell, the only change in stores is that instead of selling Naked brand juice in the RTD&E case, we will be selling this brand. A very minor change. ***A minor change in terms of the experience in a Starbucks store, I should say. @Kitenarie – well said. That’s what I was kind of trying to say when I said that there was no disruption really other than the change of juices in the RTD case. I think it is a slightly bigger deal here in Seattle, because at least as I hear gossip, one of the first new juice bars will be right here in downtown Seattle. And that doesn’t surprise me at all! re: disruption. I do believe and understand that…….I remember when they added the popcorn, a few of our regular partners weren’t even aware it was there….and also not a big seller, at least where I was. When Sbux first started adding the little ‘snack’ stands, of bagged stuff, that’s when I was a bit stunned when I first walked in….looked WAY too 7-11. They’ve since changed the arrangement, but still, I’m just not a fan of adding all those ‘snack bagged foods’…minimal is ok but they keep going too far, imo. Not too excited with the flavours listed, but I do love pulp in my orange juice. 🙂 I am nervous to try them and hope they are banana free(all naked juices seem to have banana).